As acoustic design has become essential to great spaces, new acoustic design elements are coming to the fore. 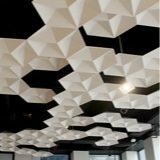 Felt made from PET plastic (Polyethylene Terephalate, or recycled plastic water and soda bottles) has leapt into the spotlight as a ‘go-to’ material that absorbs sound while offering a new palette for both visual and acoustic design. As with all materials, not all PET plastic felt is created equal. We'll discuss the pros, cons, and differences in the explosion of offerings on the market with a few tips on making smart material choices. After all, PET felt has been successfully installed in high-profile projects and is now being accepted as a standard material in the commercial design industry. There are a variety of colors, cuts, and combinations for PET felt, as seen in some of Kirei’s EchoLine variations, pictured above. PET felt is made of recycled PET (the type of plastic found in water or soda bottles) that becomes a soft, yet sturdy felt material. Durable in nature, PET felt offers great acoustic performance and can be recycled at the end of its life. 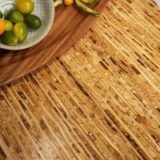 As one of the originators of the PET felt product for architectural use, for well over 15 years in the Australian and Asian markets, Woven Image has recycled over 80 million plastic bottles into EchoPanel products. Offering a wide range of solutions including panels, systems, tiles, partitions, and wallcoverings, PET felt products create versatile options that meet the needs of various spaces within commercial and residential settings—they can literally cover everything but the floor! 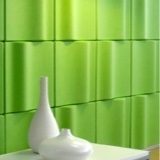 PET felt products such as EchoPanel provide an environmentally friendly acoustic design alternative that is both a stylish and functional design choice— like all products, just watch out for cheap imitations. EchoStar ceiling cloud units are anything BUT an eyesore in this open office space; photo credit Jasper Sanidad. With so much of today’s mindful generation asking for quality and performance in every aspect of life—from the food consumed, to the products purchased, to the spaces designed—it is easy to see why PET felt should be your go-to material for acoustic treatments. Mindful living is not an age or political bent, but a lifestyle that is permeating across generations; from Gen Z to Baby Boomers and beyond, we are in an era where everyone wants to live their best lives at work, play, and home. We are seeing the demands of the mindful generation playing out within the food and beverage industry, as brands look holistically at everything from the food they produce to the atmosphere they create within their space. EchoFold Mini frames the cafes main counter from above, proving PET felt can look and sound good! Such is the case with Limitless Coffee & Tea, a cafe in Chicago’s River North neighborhood. 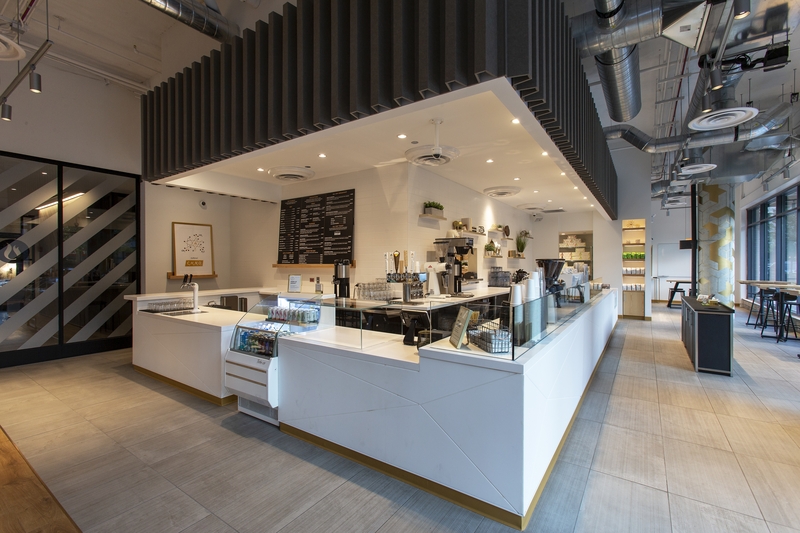 Matching its mission to bring Chicago locals the world’s purest and cleanest coffee and tea, the company created a minimalistic space using EchoFold Mini to balance an intimate yet buzz-worthy acoustic atmosphere. As with many new products, many players are jumping into the market with a wide variety of quality and usability. PET felt is a very versatile material, available in an array of colors that can be customized to fit in a variety of spaces and configurations. 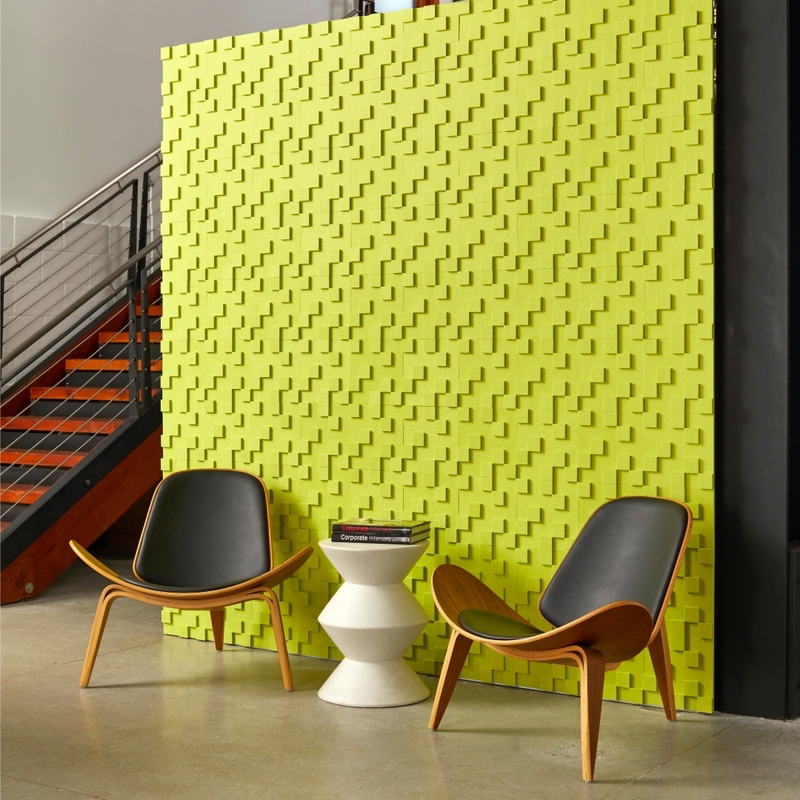 From plain white walls to custom art and sculptural elements, PET felt aids in soaking up ambient sound which is vital in today’s open, sleek, and collaborative spaces. 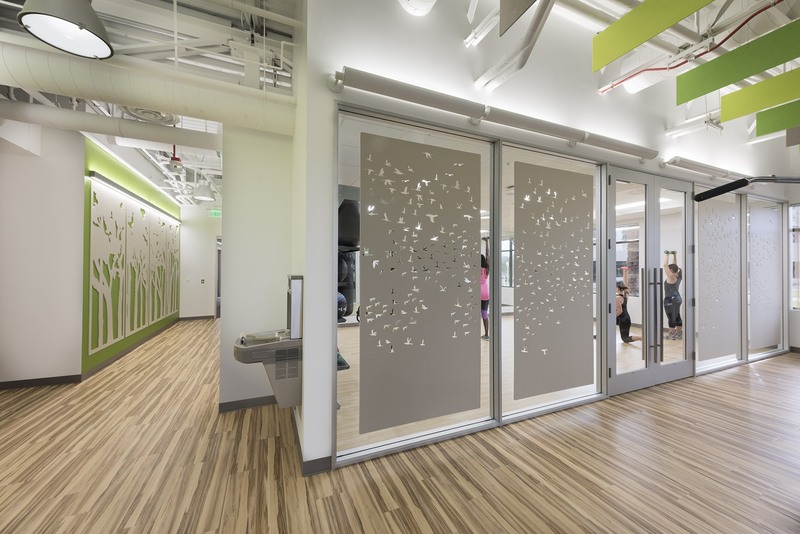 Easily customizable PET felt can be installed anywhere, as seen on the floor-to-ceiling glass windows in the Lytx office. As with any commodity, PET felt has a wide spectrum of products and pricing available, so it’s essential to work with a manufacturing partner that stands behind their product and has experience in the marketplace. Further, the term “green” can range from zero to high percentages of recycled content, so it is imperative to do research and find which environmentally-friendly products works best for you. The best PET felt products have no Red List chemicals contained in their production and very low VOCs. Some flame retardants used with PET felt can also have harmful chemicals in them so it’s good to check that as well. As with any product, those with HPDs and EPDs providing ingredient transparency and product quality and lifecycle analysis make for great partners with more assurances that what you are requesting is what you are getting. It can also help with LEED V4, Google Portico qualification, and WELL building standards. 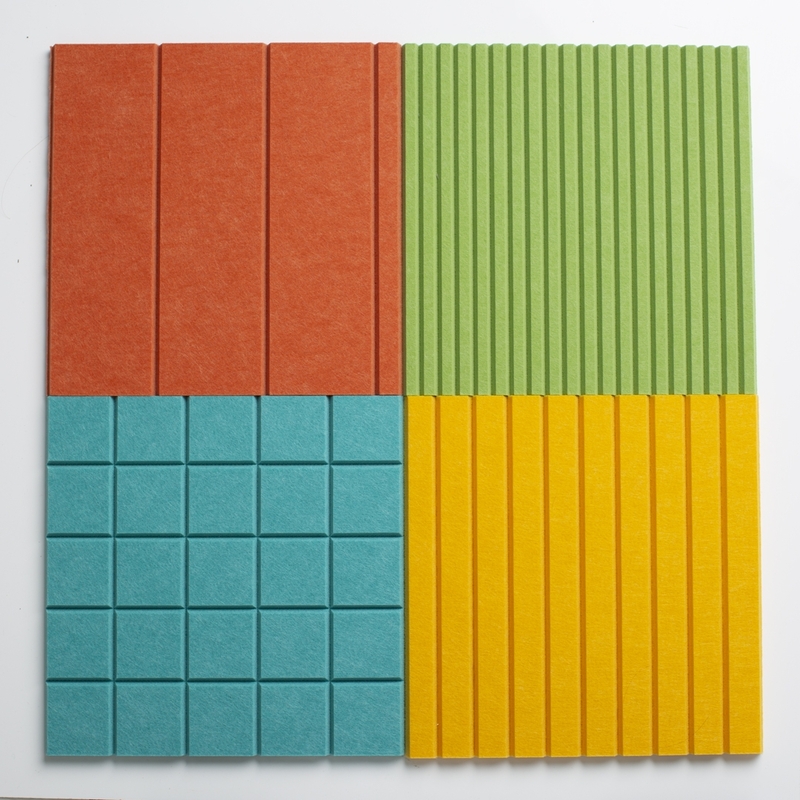 PET felt materials like these lime splice colored EchoPanel Topo Tiles are top notch in quality and usability. When it comes to the best acoustics for your space, PET felt is a healthy, productive, and beautiful alternative that may solve many of your logistical needs within commercial and residential environments. Whether seeking traditional or modern decor for your space, good acoustics will always be needed and it is our goal at Kirei to make ‘acoustic’ a word that is top-of-mind when looking at the bigger picture of functionality and design. 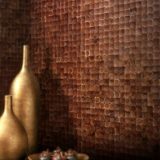 Contact a Kirei service rep to learn more about how Kirei’s PET felt line, EchoPanel, can provide visual appeal to your space while remaining sustainable in nature! Looking to get PET product samples for your project?